The Aegis and its slave prepare to battle the Forest Stage's Tank Boss. Beware of its main turret when it sweep shoots. 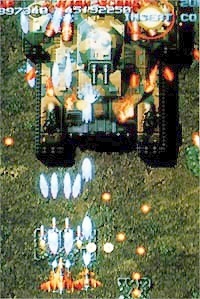 Raiden Fighters is an intense 7-level shooter and the first game in the Raiden Fighters series. One could say that Raiden Fighters is the original Raiden on horse steroids. Some people may wonder why this game has the word "Raiden" in its name, when this game has absolutely nothing to do with the original Raiden series, which is set farther into the future, in the year 2090. Some people even confused Raiden Fighters as a sequel to Raiden DX! In fact, this game wasn't called Raiden Fighters originally. During Raiden Fighters' development, it went by the, uhh, unique name of "Gun Dogs." You can see remnants of this tentative game name by watching the Raiden Fighters intro with the closeup of the Aegis fighter. Note that the plane bears the designation "GD-1," with "GD" standing for "Gun Dogs." Seibu Kaihatsu changed the name of the game to "Raiden Fighters" when they found out that people paid more attention to it during market tests just by the simple fact that the game had the word "Raiden" in its name! A good product name sells. That's an irrefutable truth in the world of business. And that's the reason why this game is called "Raiden Fighters." I'm glad Seibu Kaihatsu made the right choice for a game name. I personally cannot imagine "Gun Dogs Emporium" for a site name. For some "Gun Dogs" literature scans, visit the "Gun Dogs" Literature Page. During Raiden Fighters' development, it went by the, uhh, unique name of "Gun Dogs." The Gun Dogs logo is cool-looking though. There are five types of bullets, all of which can move at different speeds depending on how well you play. There are the slow orange bullets, the faster yellow bullets, large high caliber yellow shells, the extremely fast spiral star bullets from Raiden II, and the fast red destroyable bullets. Bosses also attack more ferociously if you are a skilled player, or they attack weakly when you die a lot. This game features some very intense, adrenaline-pumping gameplay, accompanied by a pounding techno soundtrack and gorgeous detailed graphics. The control is impeccable. Your plane responds extremely well to your joystick movements. One notable feature in Raiden Fighters is the graded difficulty. The game adjusts its difficulty according to how well you play. For example, if you are fully powered up and have not died once entering the second stage, the game will shift to its highest difficulty, in which enemies shoot faster, more frequently, and at a more rapid rate. The game will even turn up its difficulty if a player keeps starting new games. The setting of Raiden Fighters is in Eastern Asia against a huge military force headed by a ruthless dictator. The game's seven stages take place in a forest, airfield, ocean, railyard, arctic zone, into a thunderstorm, and a huge fortress. These are the eight fighters you can choose from. Click on a fighter to view its statistics. Each will appear in its own pop-up window. You select from five planes, each with a Laser and a Missile weapon. Also, each plane has a special attack for each weapon that you unleash by holding down the Fire button until your plane flashes, then release. Each plane has their strengths and weaknesses. For example, the Beast Arrow is very powerful. However, it is very slow and a big target that gets shot down quite easily. The Aegis plane is well-rounded with no real pros and cons and is best for beginner players. Other items include Bombs, which can inflict heavy damage against all enemies as well as destroy their bullets. Strangely enough, your bombs do not damage the scenery, including the helpless civilians on the ground. It kind of takes away from the realism, but this is trivial. You can carry up to seven bombs at once. There are also Slaves, which are small planes that accompany you and provide additional firepower. You can have up to two Slaves by your side. Slaves can absorb enemy bullets, like makeshift shields, but they die when they take too much punishment. Even when you just begin playing, the enemy will throw everything at you. Raiden Fighters is not for the faint of heart. The difficulty ranges from medium to very hard in difficulty. Expect to encounter swarms of Kamikaze pilots barreling their planes towards you. There are medium-sized enemies that spray bullets all over the screen. There also some annoying tanks that enter the playfield from the sides and attack you from the sides, when you are most vulnerable. With practice, a player can dodge the incoming enemy fire with ease and even anticipate enemy appearances. One of the best aspects of playing the game is fighting the bosses. Except in some cases when you are playing poorly, the bosses will not give you much room to breathe. Boss battles are intense and action-packed. They attack using various patterns, such as turret sweep shooting, bordering and sniping, and enclosure attacks. The Endeavor (left) and the Chaser (right) versus two big hovercrafts. The Chaser is performing its charged Missile special attack, commonly referred to as the "Missile Curtain"! Screenshot made possible by "The Swiss Collectors." The order of the seven stages is chosen for you randomly, except for stage 3, 6, and 7, which are the long boss stages. These stages always remain fixed in order. In comparision to the normal stages, which last about 1-2 minutes, the boss stages can last 4 minutes or more. 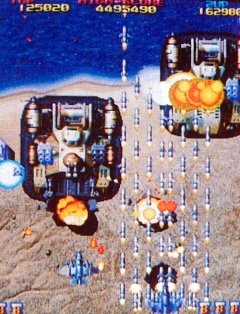 Stage 3 pits you against a fleet of battleships, with a huge battleship being the final battle. Stage 6 is a battle against a H-U-G-E flying fortress (about 3 by 5 screens in size!). You have to destroy the flying fortress piece by piece. And stage 7 is the final boss stage, which takes you into a huge walled fortress to battle the control center. Another great aspect to this game are the many secrets included. There are two secret ships in Raiden Fighters. These two secret ships reappear in the two Raiden Fighters sequels. The first secret ship is the Raiden mk-II from Raiden II. Its weaponry includes the famous Purple Lock-On Plasma Beam (affectionately called the "Toothpaste Gun" by the swell chaps at SHMUPS.) and the green Homing Missiles. It also uses the bomb it used in Raiden II, which is the Thermonuclear Bomb, deploy time, sound effect and all. The biggest disadvantage about the Raiden mk-II is its painfully slow speed. Its Lock-On Beam is also quite weak. The other ship is the Judge Spear, which comes from the Seibu outer space shooter called Viper Phase 1. The name "Judge Spear" was given to this ship in the Raiden Fighters Series; it was unnamed in Viper Phase 1. Judge Spear is a fast ship that uses green Napalm Missiles whose secondary explosions inflict heavy damage to nearby enemies. It uses the same bomb it used in Viper Phase 1, which is called the Dimension Mine. The Judge Spear fires only straight ahead, though, and its speed may work against itself, at times colliding with the slower enemy bullets. You can also play as the Slave planes of each fighter. Guess who makes a cameo appearance in Raiden Fighters? The Raiden mk-II joins the squadron, bringing along its famous Plasma Lock-On Laser, Homing Missiles, and Thermonuclear Bomb from Raiden II! 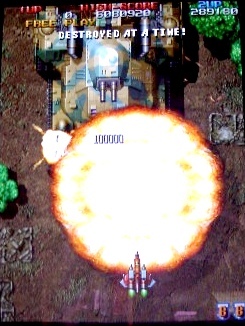 The Raiden mk-II and the Judge Spear begin with a stock of 3 Bombs (opposed to the other planes' 2 Bombs). The two ships use the same bombs they used in their original games. Additionally, the slaves for the two secret ships will assume different formations when you collect a drone icon when you already have two drones. For the other planes, their slaves will assume different formations when you do a special charge attack.